The marshmallows in Lucky Charms cereal are the draw, no doubt. 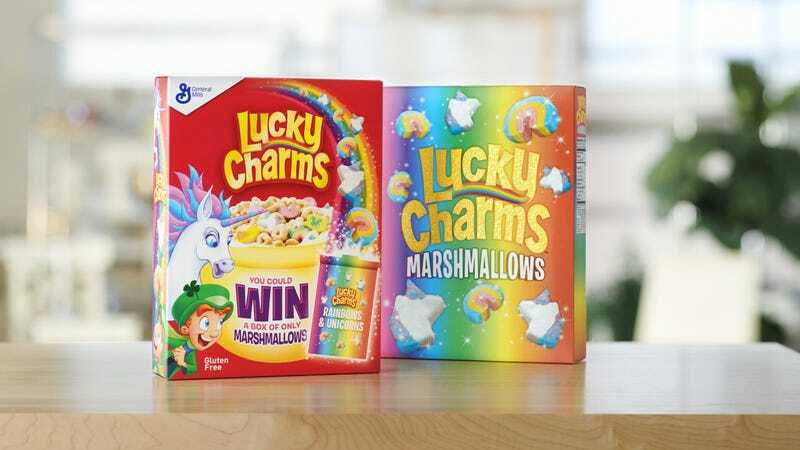 And savvy General Mills is capitalizing on America’s fondness for candy in our breakfast cereal by bringing back its Lucky Charms Marshmallow Only Promotion, which will give away 15,000 free boxes of marshmallow-only boxes to customers who redeem a code online now through September. But really, how good would a box of Lucky Charms marshmallows taste on their own? To me, a kid who hardly ever had Lucky Charms at home and had to settle for Alpha-Bits—stop trying to make me learn while I eat, Mom!—the marshmallows were, of course, the best part. On the rare times we did have Lucky Charms, I would pour them into a bowl without milk so I could eat all the cereal bits first, setting aside the marshmallows, arranging them by shape, and then eating them one at a time. There seems to be some sort of delayed-gratification psychological machinations at work here, but it would take me much too long to unpack that. And despite being the highlight of Lucky Charms, here’s the cold, chalky truth: The marshmallows aren’t very good. They’re crumbly, bland, and oddly squeaky. They don’t really have much in common with actual marshmallows at all, instead offering a sort of freeze-dried version of what is normally a pillowy, delicious treat. Look, if you’re super into the Lucky Charms ’mallows, that’s your trip, and no doubt you’ll want to buy a specially marked Lucky Charms box to receive the code contained within, redeemable for a chance to win the free cereal. But if it’s marshmallows you crave, more satisfying versions are certainly out there, for breakfast and other occasions.